The former Galloway Bros. Department Store was constructed in 1902 to designs prepared by George W. Gouinlock (1861–1932), a prominent Canadian architect. 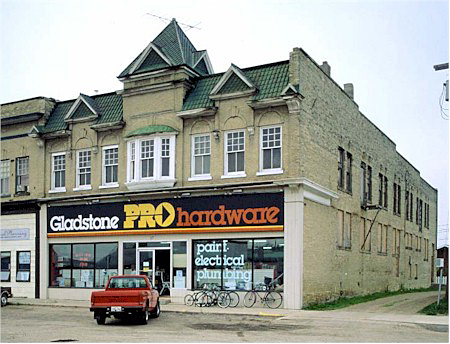 It remains one of the earliest department store buildings outside a major urban centre in Manitoba. Brothers Roper and William Galloway had established their retail venture in Gladstone in 1881. The department store was advertised as "the Live Business House of the West," boasting 27 employees, "a dozen separate and distinct businesses under one roof and management." Large showrooms, spacious stairways, and an elevator made for comfortable shopping. Acetylene gas lamps lit the store. The ground floor featured sash and oriel windows surrounded by decorative brickwork. The unique Queen Anne inspired roofline, with its pyramidal tower, added flair to the brick commercial structure. The store was sold in 1913. It operated as Collins and Diamond Department Store from 1918 to 1934, when the business failed. Since this time, it has been the location of several commercial enterprises.